Amber Gold™ V odka, produced by Latvijas balzams, part of the Amber Beverage Group, has been awarded the prestigious RED DOT 2017 Design award in the Communication Design category. 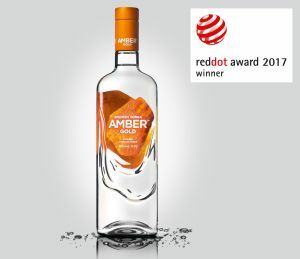 This marks the second design award that the first amber filtered vodka in the world – Amber Gold™ – has received this year. The bottle of this premium quality vodka reflects the shape of the Baltic gemstone – Amber, and was created by the design agency BrandBox (Latvia). The Red Dot Prize is one of the most prestigious design awards in the world organized by the Design Center of North Rhine-Westphalia in Germany. This year, the organizers received over 8,000 applications from 50 countries worldwide in the discipline of Communication design. All of the applications were evaluated by 24 independent industry professionals from all over the world. ”It is a true pleasure that vodka produced in Latvia, has been acknowledged by this very special prize in design. Every international award contributes not only to the product itself, but also opens up new export markets for producers. Amber Gold™ Vodka launched in cooperation with the BrandBox team is one of our innovative projects, and we are very proud about this international success”, commented Dana Hasana, Communications’ Manager of Amber Beverage Group and Latvijas balzams. “Prizes are definitely not our main goal but it’s nice to receive them, especially international ones. It strengthens our belief that Latvian design is developing properly and in the long run can become an export product and one of Latvia’s’ unique recognizable qualities. Good design comes from combining a number of factors, and together with the client we have succeeded in finding a formula for great results,” – ‘BrandBox’ on the prestigious award. Amber Gold™ Vodka is a premium quality vodka that is filtered through three different filters – first through an amber filament filter, then through amber and silver micro granules, and in the end through a golden thread filter. It gives the vodka a distinctly delicate taste. The Vodka ‘Amber Gold™’ uses 0.5, 0.7 and 1 l glass bottles of a single design. The bottle’s surface is rough with a wave-like texture mimicking an amber stone. The shapes of the labels are irregular, painted in amber tones. The series uses bottle caps of a single design – a metal cork in the color of the label. It should be noted that this is already the second international design award that ‘Amber Gold™’ has gained this year – in May the Amber Gold™ Vodka received the international ‘Packaging Excellence’ award. The ‘Amber Gold™ Vodka’ is available in the Baltic market and is also exported to other markets.